John Deere unveiled its new line of M and R Series Commercial Walk-Behind Mowers. With six models—including W36M, W48M, W36R, W48R, W52R and W61R—the new walk-behind mowers address customer needs of productivity, operator comfort, weight distribution and ground clearance, according to the company. The new steering controls have an improved hand position, and the control grips have recessed operator presence levers that provide a smooth contour during operation. The spring-loaded neutral locks ease the release of the lock and keep it out of the way during operation. 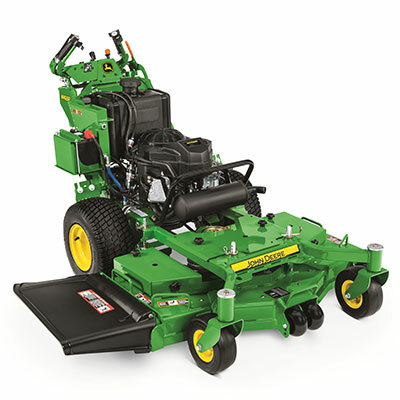 In addition, improved weight distribution and position of hand controls make it easier to raise the front end of the mower during curb-climbing applications, improving ease of use and reducing operator effort, John Deere said. The 14.5-hp recoil start M Series line features speeds up to 6.5 miles per hour. The W36M has a 36-inch deck, and the W48M has a 48-inch deck. Both models provide 4 inches of ground clearance, which make the M Series models ideal for maintaining residential properties. The electric start R Series line includes the W36R with 14.5 hp, the W48R and W52R with 18.5 hp and the W61R with a electronic fuel injected 25-hp engine. Each model provides ground speeds of up to 7.5 miles per hour with up to 8.5 inches of ground clearance. The W36R has a 36-inch deck, the W48R has a 48-inch deck, W52R has a 52-inch deck and the W61R has a 61-inch deck.